In Thessalonika, the center of Paul’s activities in northern Greece, enjoy guided sightseeing and an excursion to Philippi, a busy Roman colony where Paul preached and established Europe’s first church. Travel to Veria, where Paul and Silas were sent after being accused of treason in Thessalonika. Here, visit the Bema of Apostle Paul, where he preached the gospel to the local community. In Corinth, visit the excavations where Paul worked for 18 months and learn about Corinth's early church, which was the recipient of Paul's two Corinthians epistles. But that's not all…on this Greece tour you'll also enjoy a 3-night cruise around the Greek Isles and Turkey. Cruise to Kusadasi and visit the Ruins of Ephesus, where Paul lived and preached. You'll also see the House of Mary, where the Virgin Mary is said to have spent her last days. 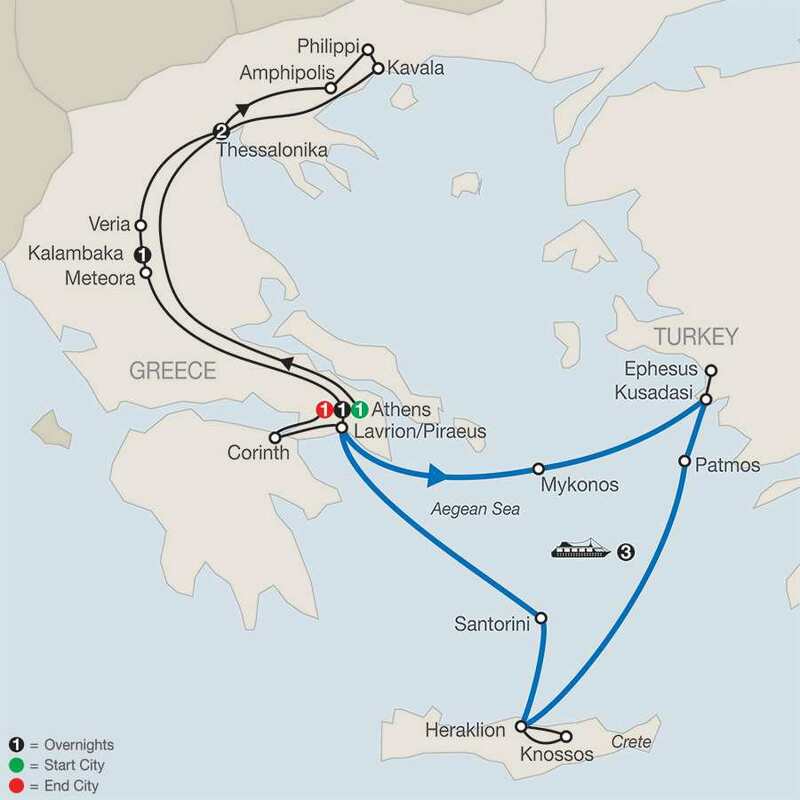 Other cruise destinations include Heraklion on Crete; Santorini; and Patmos, where you'll visit the Monastery of St. John and the Cave of the Apocalypse. Here, John the Evangelist received the visions that he recorded in the Book of the Revelation. Other highlights of this Greece tour include time at the Meteora monasteries, founded in the 14th century and where spirituality and the grandeur of nature convene. Visit the Holy Monastery of Varlaam, the second-largest of the monasteries, and the Holy Monastery of St. Stephen, where your Local Guide will show you its many historic and religious treasures. Gratuities to service personnel on board and port taxes are not included. All cabins with two lower beds and private shower and toilet. Globus Host service throughout the cruise. Welcome to Athens! At 6 pm, meet your Tour Director and traveling companions, then enjoy a welcome dinner with wine at your hotel to celebrate the start of your upcoming spiritual journey. Head north to Thessalonika this morning for guided sightseeing. Named after Alexander the Great’s sister, it figures prominently in the New Testament. This was the center of Apostle Paul’s activities in northern Greece—where he preached, founded a church, and to whom he wrote his two Thessalonians epistles. Today begins along Paul’s route via Amphipolis, a wealthy city in ancient Macedonia where a large number of Christian churches were built in the 5th and 6th centuries. Next, travel to Philippi, a busy Roman colony with an impressive library and theater. It was here that Paul preached and established the first church in Europe, and to whom he wrote his Philippians epistle while imprisoned in Rome. Continue to Kavala, ancient port of Neapolis. This morning, stop in Veria (called Berea in the New Testament), where Paul and Silas were sent by friends after being accused of treason in Thessalonika. Visit the BEMA OF APOSTLE PAUL, where he preached the gospel to the local community, then continue to Kalambaka, home to the awe-inspiring Meteora monasteries. A real highlight is in store today. Situated atop soaring cliffs and rock faces, the Meteora monasteries create one of the most inspirational sites in the world. Visit the HOLY MONASTERY OF VARLAAM, the second-largest of the monasteries, and the HOLY MONASTERY OF ST. STEPHEN, which was bombed by the Nazis during WWII but later was reconstructed by nuns. Here you will be introduced to the many historical and religious treasures. Return to Athens for an overnight. Awaken refreshed this morning and ready to begin your 3-night CRUISE around the Greek Isles and Turkey. Head first to mountainous Mykonos with its iconic windmills and brilliant whitewashed houses. Watch for Petros the Pelican, the island’s most famous resident since 1954! Visit the Turkish port of Kusadasi for an included excursion to the RUINS OF EPHESUS, the former capital of the Roman province of Asia. Walk in the footsteps of Apostle Paul, who lived and preached here, and meditate on what life must have been like for the early Ephesian Christians in this pagan society. Also see the House of Mary, where the Virgin Mary is said to have spent her last days. Continue your cruise to the island of Patmos, the “Jerusalem of the Aegean,” and visit the MONASTERY OF ST. JOHN and the CAVE OF THE APOCALYPSE, where John the Evangelist received the visions that he recorded in the Book of the Revelation during his exile. First port of call today is Heraklion on Crete. An included excursion is available to nearby KNOSSOS, the center of the 3000 BC Minoan civilization and historic site of mythology’s tales about the Minotaur and the labyrinth. Afternoon call (weather permitting) at Santorini, the “Black Pearl of the Aegean.” An optional shore excursion takes you up to the cliff-top village of Oia for one of the world’s most glorious panoramic views. Disembark and travel to Corinth to visit the EXCAVATIONS where Apostle Paul worked for 18 months with tent-makers Aquila and Priscilla. Learn about this ancient city-state and its early church, which was the recipient of Paul’s two Corinthians epistles. Return to Athens for sightseeing that visits the ACROPOLIS with the Parthenon and AREOPAGUS, where Paul delivered his famous sermon about the identity of the “Unknown God.” Tonight, join your traveling companions for a final evening of fellowship and celebration at a farewell dinner with wine at your hotel.